Dr.Cork’s theory is widely recognized in the world as it well explains the phenomenon of addiction or rebound. The general review was run in the June issue of the Journal of Investigative Dermatology, 2009. Using the illustration shown there, I’d like to explain his theory in more detail. The Journal of Investigative Dermatology is the most authoritative dermatological magazine in the world and it means much to be adopted by it. P in a hexagon represents a protease. There are two types of proteases: endogenous ones (synthesized in the granular cell layer under the stratum corneum) and exogenous ones (derived from staphylococcus aureus or a dust mite). 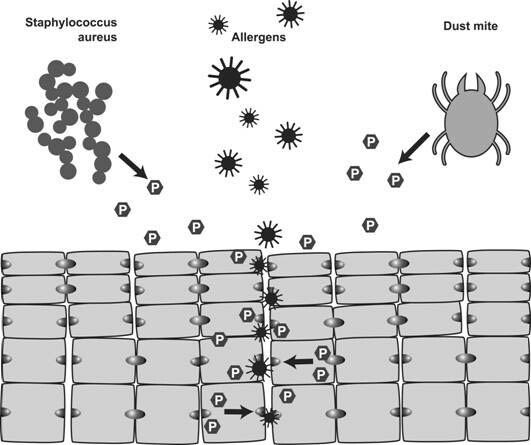 I know that dust mites are sources of allergens, but dust mite antigens themselves seem to have protease activity. This might be a reason why many patients are sensitized to house dust mites. As already mentioned in Chapter 2, 1) proteases hydrolyze corneodesmosomes binding corneocytes together, which leads to allergen penetration, and 2) protease inhibitors inhibit this protease activity. 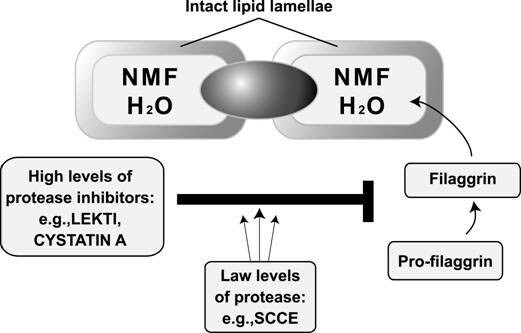 Protease inhibitors seem to be mainly produced in the sweat gland and cover the body surface together with sweat to serve as defense against exogenous proteases. Some patients with atopic dermatitis (AD) seem to have a mutation in the gene encoding this sweat gland-derived inhibitor. Corneocytes store water (H2O) to protect the skin from the drying stress of the environment. This water-retaining function is born by natural moisturizing factor (NMF), sponge-like substances in the cells, derived from a protein called filaggrin. Each corneocyte is encased in a thin lipid envelope (lipid lamellae). AD patients have a mutation in the filaggrin-encoding gene, and their NMF cannot store enough water. NMF also functions to lower the skin surface pH. If this function is impaired, the skin pH level will be raised from mild acidic (normal) to neutral. 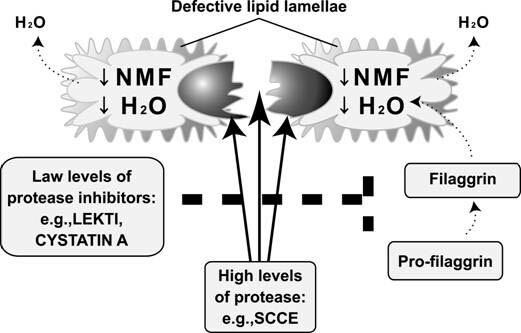 Under the neutral pH, proteases such as SCCE get active, whereas inhibitors get inactive, which makes desmosomes fragile. Lipid lamellae component productivity also goes down. Stratum corneum, the outermost layer of the skin, function depends on the delicate balance of pH. The pH gradient in accordance with the skin depth is also associated with the corneocyte differentiation. Dr.Cork expressed this role of skin pH as“the acid mantle”(healthy skin has the acid mantle). To summarize Dr. Cork’s paper, AD is caused by genetic predisposition and environmental factors. In light of the mechanism of skin barrier dysfunction , genetic predisposition is a mutation in each gene encoding 1) protease, 2) protease inhibitor or 3) filaggrin, and environmental factors include 1) soap/detergents (contributors to raise the skin surface pH), 2) exogenous proteases and 3) TCS（topical corticosteroids）. As outlined above, Dr. Cork expressly listed TCS as one of the AD aggravation factors. Cited below is the part of his review, which harshly criticizes TCS. Reading the whole part, Dr. Cork writes topical steroids are effective for a limited duration, while he warns of easy use of TCS for mild AD flare and prolonged TCS application. He also refers to ciclosporin as a treatment option for serious cases (e.g., filaggrin gene mutation). As a whole, his paper is well balanced and fair. He does not intend to totally deny TCS application. Topical corticosteroids are successfully used to treat the immune hyperreactivity associated with AD; however, increasing evidence suggests that they do not address the epidermal barrier defect associated with this disorder. The skin of patients treated with TCS is up to 70% thinner compared with that of untreated controls. There is also a concomitant decrease in the amount of intercellular lipid lamellae and a reduced number of membrane-coated granules at the SC–SG interface. The effect of these changes on barrier function was shown by an elevation in TEWL from the skin of patients treated with TCS. The skin barrier defect has been observed for a range of treatment regimens using TCS, from the short-term use (3 days) of very potent TCS to the prolonged use (6 weeks) of very mild TCS. Rebound flare after discontinuation of TCS has similarities to that observed after other forms of barrier disruption, such as surfactants and tape stripping. Barrier disruption results in the initiation of cytokine cascade, followed by an inflammatory response. This suggests that a barrier defect triggers the inflammatory response after cessation of immune suppression by the use of TCS. Furthermore, steroids have been shown to induce the expression of the desquamatory protease, KLK7, which is associated with the barrier defect in AD. Taken together, although the use of TCS suppresses inflammation associated with AD, they concomitantly seem to further damage the skin barrier, thereby increasing the risk of developing further flares of the disease. I wonder how Japanese authorities having criticized steroid withdrawal as unscientific join the flats now that Dr. Cork has scientifically proved that long time application of TSC leads to steroid addiction in the article run by the worldly recognized magazine. Can’t a certain fact be considered “scientific”until a molecular level explanation has been made in the paper employed by the authoritative magazine? Wasn’t it scientific for a small number of clinicians including me to alert steroid addiction that was clinically observed? I don’t think it’s scientific only trusting the fact proved on the molecular level. People with such an attitude are only fond of the scientific atmosphere. I think natural science begins with correctly realizing (describing) the phenomena in front of us (symptoms of patients in the medical field). Now that steroid addiction or rebound has been identified in an authoritative magazine so clearly, the JDA guideline should be revised to include the risk of steroid addiction as early as possible. I feel more sorry for patients who get criticism like“What an unscientific thing you are doing?” or“Don’t you understand that you have been brainwashed by atopy business?,”though they are fighting for TCS withdrawal after they have experienced addiction.